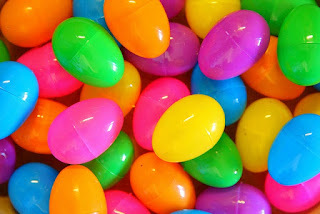 Candy filled Easter Eggs. Hippity Hoppity Easter's on it's way. You know what that means. Time to get your candy filled Easter eggs for your egg hunt. Whether you are having a small family egg hunt or a huge corporate egg hunt we can help. We started selling plastic Easter eggs filled with candy about 16 years ago. And over the years we have grown to be one of the largest supplies of filled eggs. We have had many satisfied customers over the years, which of course keeps them coming back year after year. We sell them by the dozen or also in bulk. You can buy candy filled Easter eggs in 250 count, 500 count or 1000 count. Each plastic egg is about 2 inches, we filled them with 3 pieces of old time candy. Some of the candy the kids will find when opening the eggs are : mini tootsie roll or frooties, fruit chews, root beer barrels, zotz, bit o honey, smarties, salt water taffy, swedish fish, sour patch kids, razzles, double bubble, banana splits or jolly ranchers . Just about any candy small enough to fit in the eggs. We always try to mix up the candy in the eggs, that way when you spread them out it's not just on type of candy the kids find. We make them up to order that way they are not sitting around in our candy warehouse for months with the candy getting old. We even add a piece of tape on the seam to keep them from opening up in shipping. So if you are looking to buy candy filled Easter eggs give us a call. We will help to make your Easter egg hunt a success !